Example 1. A plain "munitions grade" kaskara, most likely of the late 19th Century, having the typical disc pommel mounted in the usual fashion such that the tang passes through the flat faces of the disc. The pommel and grip are wrapped in thin leather over wooden cores. The iron crossguard includes the typical short languets on either side and has a square cross section at the ends, rotated 45 degrees out of the plane of the blade. The double-edged blade is forged and has a single wide fuller running from the guard almost to the spatulate tip. The scabbard is of red brown leather and shows the characteristic distal flare. The scabbard tip is covered by thin sheet iron. Overall length: 102.2 cm. (40.2 inches); blade length: 89.7 cm. (35.3 inches). The kaskara is characteristic of the western parts of that broad African savanna region known as the Sudan, areas now part of Chad and Sudan (the country). 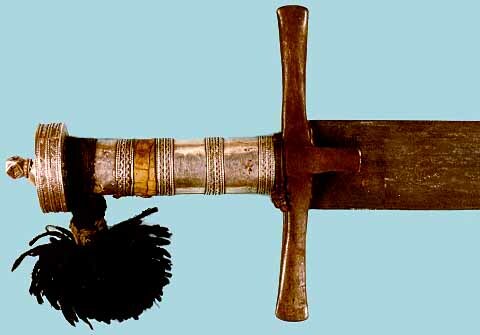 While most surviving examples are from the 19th Century, the type is believed to have originated in the 16th Century, and may represent a localized survival of the straight, double edged medieval Arab sword (North, 1989, p. 142). Victorian era writers on swords frequently opine that these are survivals of European medieval swords, but this view in presently strongly disfavored. A later European influence is present, however, in that the blades, even from the 16th Century, are frequently of European manufacture or of local manufacture clearly imitating European blades and their markings (Briggs, 1965, p.44 and Spring, 1993, p. 41-42). Spring notes that the kaskara has continued to be worn in rural areas of Darfur at least until very recently, if not presently, and the well worn condition of example 2, illustrated below, supports this contention. The kaskara is worn horizontally across the back or between the upper arm and thorax (Spring, 1993, p. 41). The blades are usually about a yard long (or just under a meter), double edged and with a spatulate tip. The edges are typically parallel for most of the length of the blade, although a slight taper may also be seen. Example 1, above, has a broad central fuller running from the crossguard nearly to the tip of the sword. Many better grade blades will have a single, moderately wide, short fuller running about a quarter to a third of the blade length. Other varieties, typical of European broad double-edged trade blades of the times, have been observed, such as those with three (or so) narrow, short to moderately long fullers (as are also seen in takoubas and espada anchas; similar astrological engravings may also be seen, further suggesting similar, if not the same, sources of imported blades.) The frequent presence of European bladesmith's marks on these blades are not a reliable indicator of blade origin, as such marks were frequently copied in imitation of those on imported blades by local smiths (Spring, 1993, p. 42). Koranic and talismanic inscriptions are also found inscribed on kaskara blades, regardless of origin. Kaskara hilts resemble, only coincidentally, medieval European swords in having a simple crossguard. The crossguard has a typical short extension toward the blade centrally, a languet, which Briggs (1965, p. 45) surmises is likely of Turkish stylistic origin. The crossguard is usually forged of iron; brass examples are also known (Briggs, 1965, p.45). The pommel is of disk form, likely composed of wood, mounted with the flat faces perpendicular to the center line of the sword blade. The grip tends to be round. Both grip and pommel are covered with leather in poorer examples and with embossed and or overlain silver (and even gold) in finer examples. The scabbards are characteristically of red-brown or brown leather; sometimes exotic hides will be used. A leaf-shaped flaring in the width of the scabbard is characteristic just before the tip. Better examples will have chapes and other fittings of precious metal. Example 2. A kaskara of the mid to late 20th Century. 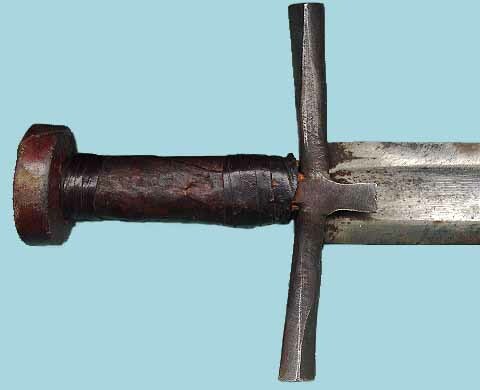 The hilt is of the characteristic shape and covered in thin German silver or low silver alloy sheet with applied raised trim of the same metal. The core of the hilt is wood. A small band of reptilian skin is also present on the grip. A black wool tassel is affixed to the grip beside the pommel. The forged iron crossguard includes the typical short languets and has flattened tips. The double-edged blade is made of modern sheet steel of uniform thickness, much like a modern machete, having filed edges, but with the quarter of the blade nearest the hilt left entirely unsharpened. The traditional spatulate point has been retained. The brown leather scabbard features various bits of plastic trim. Overall length: 102 cm. (39.7 inches); blade length: 87.3 cm. (34.3 inches). North, Anthony, "Swords of Islam," in Swords and Hilt Weapons (New York: Weidenfeld & Nicolson, 1989) p. 136 - 147.